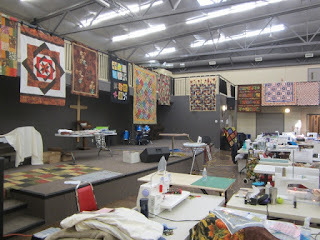 I had a great time at quilt retreat this past weekend. This retreat was hosted by my Aunt Arley at the Sunny Side Camp on Sylvan Lake. It started on Thursday afternoon and ran till Sunday noon. I have only ever done retreats that started on Friday. I got lots done with the extra day. 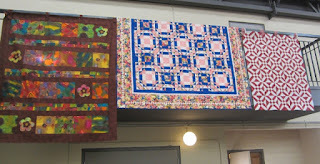 I loved this little quilt. 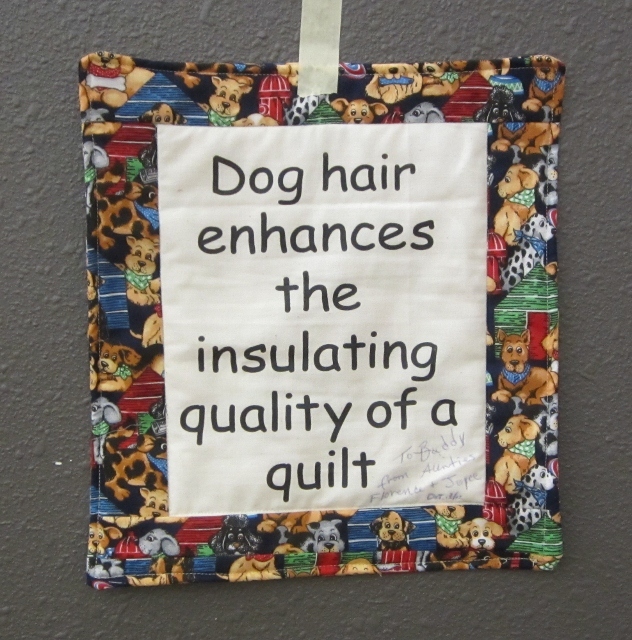 I have Mr Lex in the house so our quilts have dog hair. I cleaned my sewing room yesterday and do not let him in the room but yes I vacuumed up dog hair. Oh lets see who reads this. I went to vacuumed a fly on a quilt block, yesterday. But guess what happened? I vacuumed the block up. A red log cabin from yesterday's post. I hope to get it out of the vacuum tonight. Anyone else ever do that? Or What silly thing do you vacuum up? 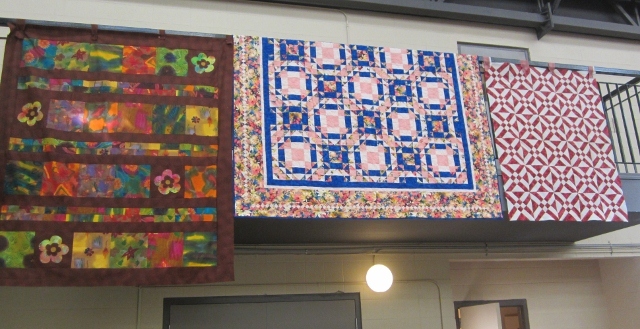 As the ladies finished a quilt top they were hung on the rails above. There was shopping available. 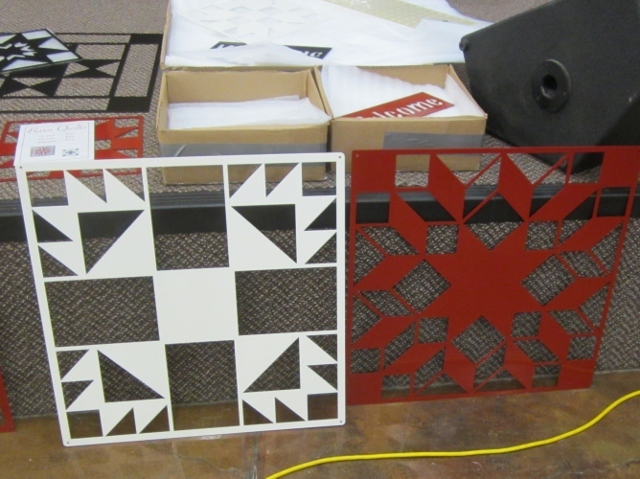 Deb brought these metal blocks to sell. Arley had some flannels and notions to sell. Some fabric here and there. 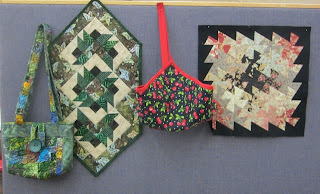 One lady brought a mini quilt shop but No photo. 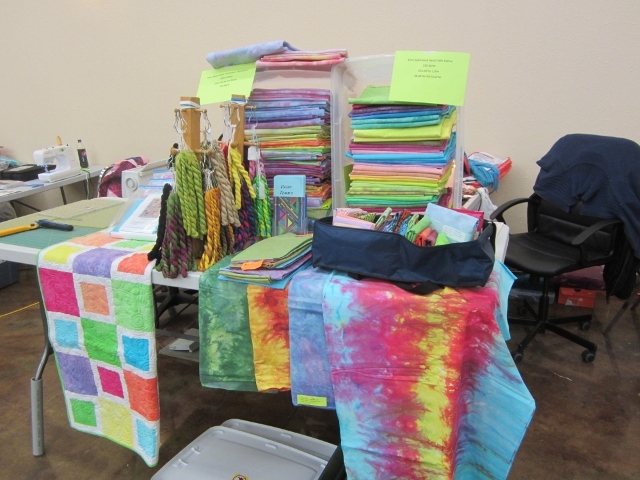 I took my hand dyed fabric and thread to sell. I did not set it up till after lunch on Saturday. It took up lots of room. There was also the garage sale table (no photo). We donated stuff to the table and if you wanted the stuff you donated cash to the tin jar. 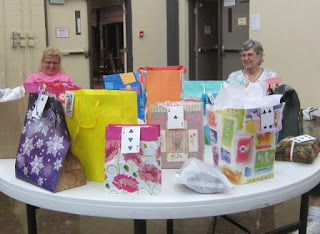 It raised money to send a kid or two to camp. More finished projects on display. Barb made the green runner and the Cherry casa-roll cover. Not sure who made the purse and twisted wall quilt. We had a gift exchange. This was optional. If you wanted to do it you brought a quilt gift bag worth $25. Then on Saturday after dinner we got a card. Then Arley read out the cards and you found the matching gift. I got a book on free motion machine quilting - one I did not have, and a spool of 17 wt thread to try out. The book has some ideas I have not seen so I will use it. Thanks Deb. I also found out at least two of the ladies, I had not met, are followers of my blog. Hi ladies. I have added today's post to Freemotion by the River. Look at your sales display!! Looks like luscious fabrics and threads. What a packed weekend - looks like so much fun! Now that you're back I can tell you what I finished on Thursday; the quilt back. Let's get together, shall we? Looks like it was a good time. I have no dog hair -- but *cat* hair on my quilts, and as they help me in the sewing room, I vacuum it up quite regularly. Looks like a wonderful retreat and how neat that you could shop without even leaving! Hope you can rescue your little block....don't try and vacuum your fingers....that hurts! Thanks for sharing. Sounds like a great retreat. I have lots of cat hair on quilts... one love to sit on it as I stitch the binding on. I don't think I have vacuumed up a block but have done the thread on a spool before. What fun at the retreat. No I haven't vacuumed up a block yet, but there's always a first time! I am certain I would have loved this retreat. Looks like you had a great time spent being so very productive! It was great meeting you Cathy, great retreat!! !